On a farm there is always more to do than time to do it. Time management skills and systems are crucial for prioritizing daily, weekly, and monthly tasks, delegation decisions, annual planning, economic viability, meeting market demands, and accomplishing a healthy personal life. Put simply, effective time management is a fundamental and crucial component of farm and personal success. A first step to effective time management is to categorize the tasks to be done based on how urgent and how important they truly are. Urgent Actions: Things that you feel you need to react to now or very soon. Important Actions: Things that contribute to your long-term mission, values, and goals. Some things are urgent and important, such as a broken fence and cows out. They can pull us away from the important work at hand. Imagine you have to stop planting to deal with the cows. Then it rains, and you didn’t have the planting finished. Like a line of dominos, other areas of farm work and our personal lives fall. Other things may feel urgent but might not be important—such as the phone ringing—and distract us from tasks that are important. 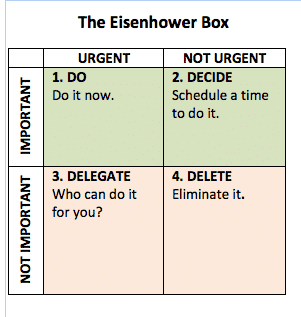 The Eisenhower Box is a useful tool to for taking action and organizing your time. 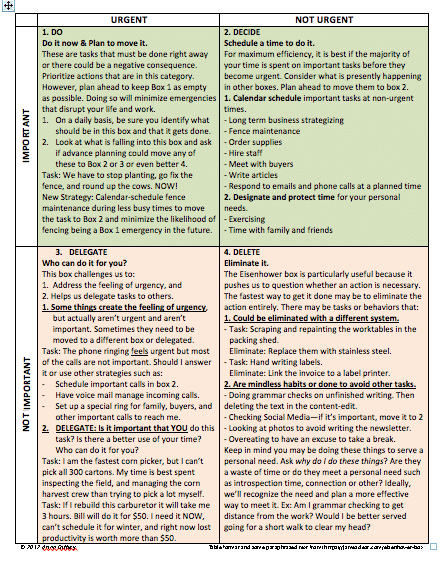 The format breaks tasks into 1 of 4 categories based on urgency and importance. Separating these is simple enough to do once. Doing it continually can be challenging. The box provides a framework to do it consistently. Consistency is key to success. Make your work plans and to-do-lists in it. Doing so will hold you to prioritizing tasks effectively. It will also develop prioritization habits and analysis skills. Keep blank copies where you do your daily planning: at your desk, on your clipboard, etc. A template is provided in this document. Record and analyze. As you go through the busy season, capture farm activities in the category that you want them to happen in the future. 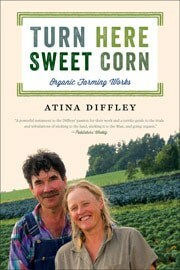 For example, if you find yourself writing a CSA newsletter at midnight the night before distribution in the heat of harvest, you might note in the important and not urgent box that next year you will create CSA newsletters in January, and only finalize them with a bit of current news during the busy season. After recording activities for a period of time, you will be able to create an annual work plan. It can be close to impossible to make system changes on a farm during the busy season. It’s important to capture what needs improvement so you can attend to it later when you have time. Without recording, things are often forgotten and the same inefficient process is repeated again, year after year. Analyze the Delete box. Items that fall into the not important & not urgent box may just be old habits to be gotten rid of, however they might be serving a personal need that is not readily apparent. Is there a reason you do these things? Do they provide down time? Connection, or some other personal need? You may be better served recognizing the personal need and finding a more effective way to meet it. Eisenhower Box Download Download this article and a blank template for your personal and business use.